Aries Escape: Episode No. 15 is one of those games that manages to be both perfectly pleasant and juuuuuust challenging enough to make you really get your brain engaged. There's a lot of code breaking going on, to the point where you might have wanted a few more inventory-centric puzzles instead of all these lockboxes scattered everywhere, but the puzzles here are still clever (and even sneaky) enough to make up for it. One of the easiest ways to get "stuck" is to simply miss some of the white directional arrows when they pop up unexpectedly, or to forget yon swimsuit torso can be used with some items as well. Mix it all up with a clean User Interface, bright and clear graphics, and a sunny soundtrack (not to mention a save function), and you have a perfect example of a developer who knows how to craft a well made, user friendly escape game. Don't be sad when it's time to say goodbye to summer... celebrate the upcoming holidays instead with Aries Escape! Aries Escape: Episode No. 15 Walkthrough now available! This can be used as a step-by-step walkthrough, but as always, isn't it more fun to explore a bit first? If you get stuck, just refer to the section that concerns the first puzzle you haven't solved. I'll let you know if you need a clue and/or inventory item from an earlier section to proceed. There are three "rooms" in this escape: the bedroom (where you begin), the living room, and the porch (which you can't access yet). This box can be found in the bottom drawer of the bedroom nightstand. Take a look around both rooms. The nine letters shouldn't be hard to spot! They're on the purple hats on the shelf in the living room. Hmm. "AWELNLHOE" doesn't work, but perhaps it can be rearranged into something more appropriate? "HALLOWEEN." That's a lot of clicking, but you'll be rewarded with the GOLD CIRCLE KEY. The porch looks inviting, but you're not exactly dressed for the occasion. There's some appropriate clothing in the furniture nearby, but it'll need to be unlocked first. Use the GOLD CIRCLE KEY to unlock the top drawer of the bedroom dresser. Take the BATHROBE and place it on the avatar next to your inventory. Now you can go outside! In the magazine pile on the dining table. Under the turquoise dish on the porch. Behind some plates in the top of the large living room cabinet. Inside the rightmost jack-o-lantern in the living room. In the middle drawer of the large living room cabinet. In the third drawer of the bedroom dresser. In the green box within the bottom drawer of the bedroom armoire. On one of the chairs on the porch. In the blue and gray bin on the porch. This box can be found on the coffee table in the living room. Perhaps its color is significant? Take a close look at the jack-o-lanterns across the room. The eyes of the jack-o-lanterns form six matching symbols, but they don't seem to work. Even if you reverse the order as suggested by the "nose" of the jack-o-lantern on the right. But maybe those aren't the only six shapes to be found here? Take a closer look at the mouth of that rightmost jack-o-lantern. Following the direction of the arrow: triangle, square, triangle, circle, circle, triangle. Take the PAPER WITH NUMBERS. This box is under the red pillow on the couch in the living room. Hmm, six sliders, each with five possible positions. Is there something else nearby that resembles this? Take a look at the bat painting above the couch. From left to right, with 1 at the top and 5 at the bottom, move the sliders to these positions: 3,1,2,5,3,4. Take the TURQUOISE PAPER (RIGHT HALF). This box is in the top of the large living room cabinet. To solve this code, check the walls for something with numbers. Lots of numbers. Take a look at the calendar in the bedroom. How can you narrow this down to just the numbers you need? Placing both halves of the TURQUOISE PAPER on the calendar reveals five numbers and...an "x"? Or is that a multiplication sign? Multiplying the five numbers reveals the code you need: 6 x 12 x 17 x 22 x 31 = 834768. Take the SUNFLOWER SEEDS. You may have noticed this box in the top drawer of the bedroom dresser. The key you need is somewhere on the porch. Hey, that bird on the fence is guarding the key! Looks like you'll need to distract him. You'll need to bribe the bird with a certain item from your inventory. Place the SUNFLOWER SEEDS in the turquoise dish on the table, and back away to give him some privacy. When you return to the scene, you can take the SILVER KEY. Open the pink box with the key and take the BATTERY. This box is in the second drawer of the bedroom dresser. You'll need two clues to solve this: one from your inventory and one from a piece of art. Note the directional arrows: you can click to the right of the picture. Looks like a job for that BATTERY you found. Inserting the battery reveals a grid of nine letters. Given the theme of the game, you may be able to make sense of it already. The PAPER WITH NUMBERS will reveal the order of the letters. Enter "PUMPKIN" into the box and take the SCREWDRIVER. Hmm, this drawer won't open, but there's no keyhole. Perhaps it's being held shut by other means? Click the directional arrows to see two screws on either side of the armoire. Remove the screws with the SCREWDRIVER and open the drawer to get the ACORN. Another locked door with no keyhole? This is becoming a habit. Click the arrow to zoom in on the top of the cabinet and reveal another pair of screws. This box is in the bottom of the large living room cabinet. It needs a seven-digit code, and each digit needs to be a different color. Yep, it's the code from the books in the small living room cabinet. The numbers are 6341975 and the colors are red, blue, yellow, blue, green, red, yellow. (For the color-blind: that's 1, 4, 2, 4, 3, 1, and 2 clicks.) Take the ACORN. This box is on one of the chairs next to the dining table. You'll need a clue from your inventory to solve this. It's the PAPER WITH SYMBOL CODE. Symbols like the ones on the paper appear somewhere else in the house. Take a look at the bedroom clock. The five symbols on the clock seem to correspond to the numbers 12, 3, 6, and 9. But how? The code is based on the number of circles in each symbol. Enter 48725 into the box and take the GOLD BLADE. This box is in the bottom drawer of the bedroom dresser. You'll need a key for this, but not a normal one. In fact, you may need to construct it. Open the WOODEN HANDLE in your inventory and combine it with the GOLD BLADE to produce the key. Open the box and take the ACORN. This bin is located on the porch. By now you've probably opened it and taken the ACORN, but there's more to be done. Click the arrow to zoom on the right side of the bin and reveal a code panel. Have you seen a sequence of five colors like this anywhere else? Take a look at the cups in the large living room cabinet. Remove the top of the bin and take the ACORN BOX. You know what to do here! If all went well, you should have ten ACORNS by now. Insert the acorns and take the GOLD SQUARE KEY. Once again, don't you think you're a little underdressed? And once again, the clothing you need is behind a locked door. Use the GOLD SQUARE KEY to unlock the top of the bedroom armoire. That's a perfectly nice DRESS, so place it on your avatar. Now that you're dressed for the day, you can leave if you wish...but there's another ending, so you really should save your game first. Proceed as with the regular ending (or load your saved game), but don't leave yet! Hmm. There's nothing left in your inventory to use, but maybe something has changed in your surroundings? Taking a good look around should provide some "illumination." That pool of light shining on the small living room cabinet wasn't there before. Use the left directional arrow to reveal a hidden panel on the side of the cabinet. Another code involving six shapes? Talk about deja vu. This time it's the eyes of the jack-o-lanterns, not the teeth. Square, triangle, square, circle, triangle, circle. Take the SUNFLOWER SEEDS. Well, you know what to do with these. Feed the seeds to the bird on the porch and take the RING. Now you're leaving in style! that stupid calendar mocking me. Seemingly a math problem but just jumbled enough I can't calculate a 5, 6 or 7 digit number which are the boxes I have to open. I love the power of posting!!!! I noticed that the positions are similar to the bat painting (which has already been used), but might be a red herring. 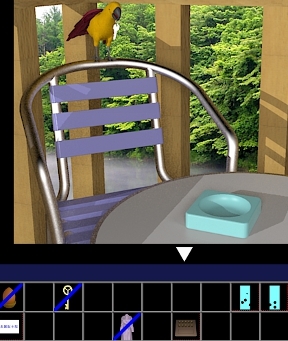 8 acorns, put the roby on the lady torso in the inventory, I opened the blue cooler on the porch, can't figure out how to get the key away from the parrot, and I have both turquoise hole-cards for the calendar, but am stumped how to do the math. it was much simpler than I first realized. the angled t looks like a multiplication symbol. So try multiplying all the digits and you get a 6 digit number.
. None of the combinations I'm trying make any sense (or work). Oh for... Power of Post! It's not the eyes, it's the teeth! @korvathefox, I made the same mistake. Also, re: the parrot. You need something the bird wants. If you had it you'd know. If you don't move on to the next puzzle. "So try multiplying all the digits and you get a 6 digit number." Hmm, chapel204. How does that work ? I hadn't looked around the side of the blue cooler on the porch! *head slap* duh....always making things harder than they need to be. probably the only combination I didn't try. Thanks! Pretty easy after that. @lilymay Sorry a better sentence might be. acorn box holds the armoire key. @lilymay Sorry I should have specified that you need something to solve the calendar puzzle. two pieces of paper with holes in them. little yellow cube in the bottom drawer. There is a box for that key. Now stymied for the second (Happy?) ending. @korvarthefox ? Anyone? Thanks! I found the hidden space faster than I thought I would. Pretty sure I know what's inside it. And maybe somewhere you can now click where there was nothing clickable before? and where have we seen those shapes before? yup. Was momentarily distracted by the extras. the piece of paper with the weird symbols on it. but beyond that I'm clueless. Never mind, power of the post gave me an idea, and it worked! It's all in the number of circles. Woo! Out with the happy end! happens to me time to time. I use a Mac. Really liked this one...walkthrough on the way. was looking for the extra arrows when zoomed in on certain areas to access another angle. But once I twigged that, it was fine (and I like that better than having to pixel hunt for the other angle). there is a small cabinet in the living room but I see no light. no left or right arrow on it either, in the bedroom there is a snall cabinet there with a shiny light but again no left or right arrow. i'm confused. The cabinet that you need is the one in the living room below the nine hats. If there's no spotlight shining on its lower left corner, make sure you've completed all the other steps. You need to zoom in on the cabinet (just as you did before when opening it with the screwdriver) before the left arrow will appear. Paul, I had the same thing happen. Try going out onto the porch, see if there's a blue parrot there. I'd done everything, but the spotlight didn't appear on the small cabinet until I went outside, saw the blue parrot, and went back in. it looks like another (slightly less unintuitive) way to get the spotlight to come on is to try to leave through the front door, but click "Cancel" when prompted. I see no blue parrot outside and I still see no arrow. I did everything asked in the walkthrough and I have no inventory left. I don't get it. that is not open yet is the top drawer in between the 2 beds. is this what might be what the problem is? if so either the walkthrough omitted this part, or I accidentally skipped by it. let me know. So yeah, I'm really not sure what the problem is, if you've clicked "Cancel" and there's still no spotlight. I guess I did see the "try to exit but hit cancel" I feel like an idiot. thanks for being patient with me. I feel stupid. No worries! It's not like that's an obvious mechanism...would have made more sense for the change to happen without that last step. "Sometimes all you want to do is kick back and relax with a disembodied, bikini-wearing torso"
Ha ha, my Japanese must be improving. This one took less time to translate than the last. Since yesterday, I've been on a trip with him. We're staying in a beautiful bungalow in the woods. I felt good right from the start of the day. But he doesn't seem to be here. I wonder if he went for a walk. Shall we go looking for him...? He was there when I left the bungalow. "I've just taken a little stroll." "Have you seen a blue bird?" "OK, then come look for it." So saying, he went off somewhere. "Since it's such a nice morning, I went for a little stroll." "Yeah, the weather's nice too." "That ring looks good on you." Then we ate breakfast together. Today also seems like it will be a beautiful day, right?